I used 1/2” copper tubing with flare fittings, and 1/2” threaded steel pipe & fittings. The concept is that the warm or hot air gets pumps up to the top, and then goes through about 37 feet of copper tubing coiled up, and cools down to make the water condense. Then the water gets caught in the drip leg, and the rest of it gets separated out in the water/oil separator. So far, I think it works. I got the compressor warmed up good, and the air coming out of the tank was pretty warm, and by the time it got to the water separator, it felt quite cool. The tubing on top was warm, and on the bottom was cool. I’ll have to test it out more this summer when the compressor gets hotter and the weather is moister, but so far it really seems to be helping…. Happy feast of St. Joseph, foster father of Jesus, a carpenter and patron of all fathers! This is a great idea! I recently bought a small compressor for my garage (IR Garage Mate) and I also did some research on the after-cooler idea. 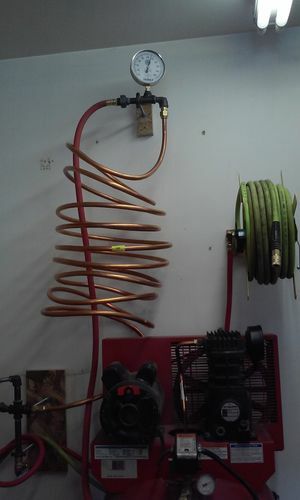 I thought about buying a 1/2” copper wort chiller and maybe rigging that up somehow in a bucket of water. Your design is good because any moisture that condenses out should run down to the drip leg. I wonder if an old automobile A/C condenser might also work? Are you getting more moisture in your water trap than before the after-cooler was installed? Good job and thanks for sharing. 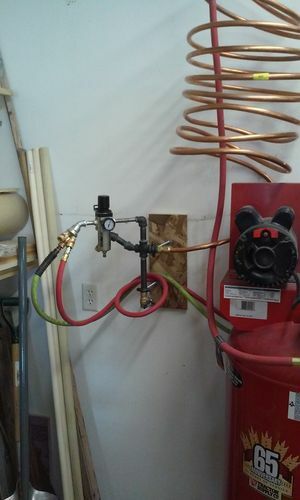 I like your set-up, I used just 1/2” copper pipe and fittings to build several vertical loops, with drains on the bottom of each loop. I no longer get any water in my water trap. Copper is gawd-awful expensive though. The A/C condenser idea is good, but there may be a tad more flow restriction then the copper tubing. Advantage is you can easily tuck it away with an electric radiator fan keeping the breeze going. A common trick for instilling air lines is to have them slant (usually toward the compressor) so any water will collect where a drain valve is installed (bottom of the compressor tank). A water separator is most effective at the far end of the air line after the air has had the most chance to cool off. 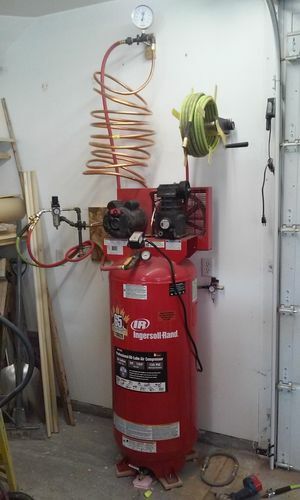 Very good work, disguising your still as an air compressor! Its even bad for wood as contaminants may effect finishes. Dont forget to keep draining the pressure tank as water will still form in here. The coils would appreciate you making a stability frame for them as well, to prevent movement and possible stress fractures. Additional Information regarding Automotive coolers, the radiators and associated components in your car are designed to work at about 1 atmosphere above ambient, the output of a compressor can reach about 10x that so beware. I am not sure of the pressures incountered in Transmission coolers or power steering systems. I also saw the wort chiller and thought of using it, but was told by my Mechanical engineer dad that a pressurized system like this should use flare fittings. I’m really not fond of experimenting with any type of system that may not be able to handle air pressure, as I’ve heard about what can happen with exploding pressurized equipment. The larger the volume of air, the worse it is. So, I’ll stick with approved air lines, fittings & connections! I work for an industrial contractor, and we end up having to pneumatically test equipment and piping at times instead of the preferred hydro test. Lets suffice it to say that the entire area is cleared of people and locked out when the system is pressurized.